Related to the cabbage and originating from Belgium, Brussels sprouts have a sweet, nutty taste. The peak of their season is from October through March; however, you usually can find fresh Brussels sprouts in your grocery store all year long. 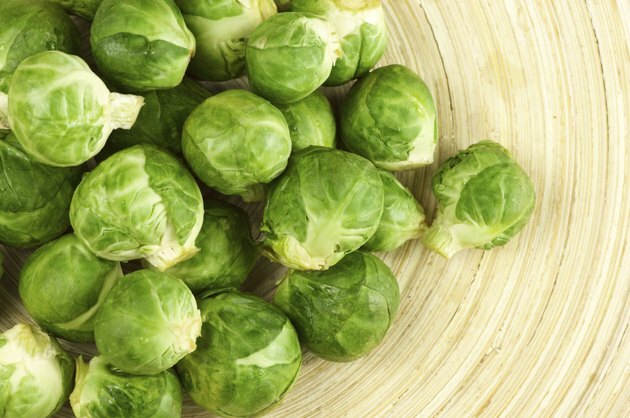 The smallest and most compact sprouts are generally sweeter than the larger ones, which may help those if you find Brussels sprouts to be bitter. Cooking Brussels sprouts in the microwave is ideal for whipping up a fast side dish that is nutritious and delicious. Remove sprouts from the stalk, if they are still attached, and cut off any wilted leaves. Rinse the Brussels sprouts under cold water to remove any dirt or debris. Cut large sprouts in half for faster and even cooking. Brussels sprouts are dense, and you'll want the core to be the same temperature and consistency as the outer leaves. If you prefer to leave the sprouts whole, cut a line into the bottom of the sprout with a kitchen knife; the cut line will help heat reach the core for more even cooking. Lay the Brussels sprouts in a microwavable casserole dish in an even layer and add one or two inches of water. If the dish does not allow you to lay the sprouts evenly, then stir the sprouts halfway through cooking. Cover the bowl of sprouts with a microwave safe lid or with plastic wrap. Cook the sprouts until tender. Microwaving times can vary depending on the size of the microwave and the amount of Brussel sprouts you are cooking. For example, one pound of whole sprouts may take approximately 6 minutes to cook. Whole sprouts will take longer to cook the halved ones. Remove the sprouts from the microwave when they are hot throughout the core with a tender consistency. Serve while hot.